150 posts and 305 email followers later, my blog is celebrating it’s 2nd birthday! In celebration, I have teamed up with vitamart.ca to do a giveaway! 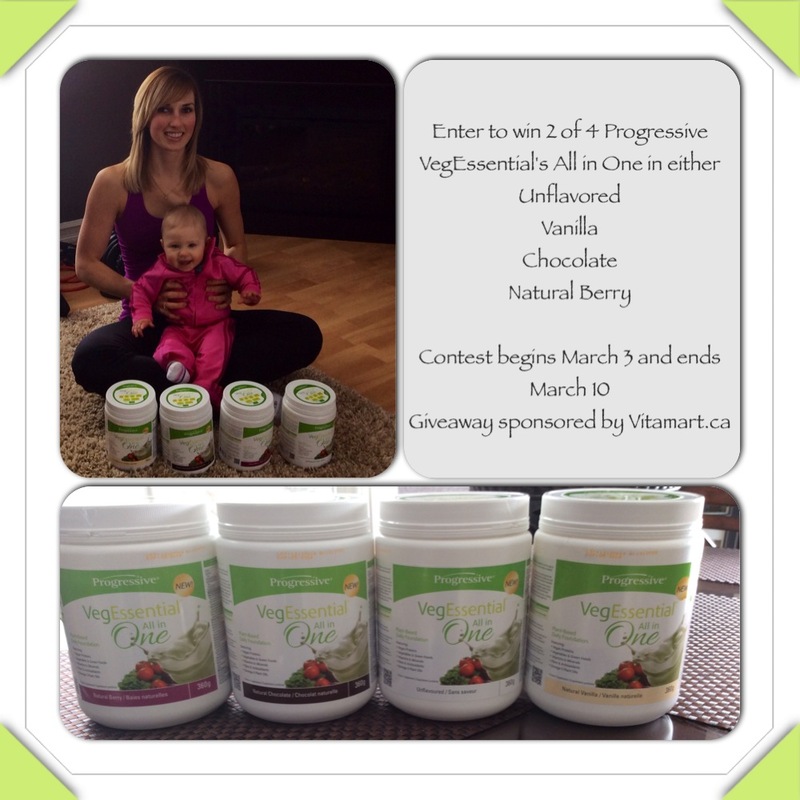 2 lucky winners will win 2 360g container of newly released Progressive VegEssential All in One protein in either chocolate, vanilla, unflavored or natural berry. 3. Comment below letting me know what your favorite flavor of protein is! Vanilla! 🙂 And thanks for some awesome workouts and recipes, Tiff! Keep em coming! My favorite flavor is vanilla when it comes to protein powder. Thank you for all the great tips on living a healthy lifestyle! Vanilla ☺️ thanks for the great recipes and all the wonderful health tips to keep me motivated! Classic vanilla is usually my go-to for protein! It goes with nearly everything. Haven’t tried any of them, but would guess vanilla! Vanilla!! I love all the recipes and links you post!! Chocolate of course! 😉 loving the support you give followers! I have never used any type of protein powder before but have recently been thinking I should start. I just have no idea where to even begin. I’m not sure what I should be looking for when purchasing a protein powder. That being said I think I would prefer a Vanilla flavour. Protein powder can be part of a great pre and post workout meal if you chose one with minimal ingredients. I use sun warrior which I purchase from Vitamart.ca, it’s the cheapest I’ve found it. It’s great in smoothies. For post workout I pair it almond milk, spinach and mixed frozen berries (you can use any fruit). For a quick pre or post workout you could just use a shaker cup and use almond milk and protein powder and also eat 1/2 banana with it. If I need a quick supper I’ll also have a protein shake. It’s a common misconception that protein makes you look like a big body builder. It’s not true, it can just replace other protein, like chicken turkey…. Hey! Which Sun Warrior do you buy?! There are 2 two different? You are such an amazing inspiration! I love being motivated! 😊 Thank you! Hey! I browsed your website! And found the answer! Thank you! Hey! I was just going to message you! I use sun warrior raw vegan. Here is the link 🙂 http://www.vitamart.ca/sun-warrior-protein.html. Vitamart.ca ships out of nisku, so shipping is super fast and they have the cheapest prices I’ve been able to find. I hope this helps! I try and find a protein that has few and quality ingredients, and no artificial sugars. And thank you so so much, that means more than you know. If you ever need anymore help just let me know. Love your tips, thank you. Vanilla!!! Because it’s so universal!! I put it in clean baking treats, smoothies etc. Vanilla and Natural Berry would be my favorite flavors. I am really excited to try this product. Hope I am lucky in this contest! I’ve tried all different kinds of vegan protein, and I think Progressive & Genuine Health are my favourites! Keep it up!